Repeat- Writings on Architecture: It's Not Bombed Out Berlin - It's our Legacy! 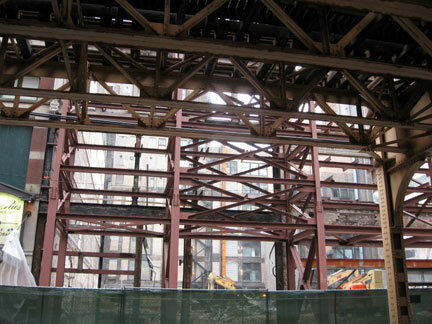 A photo-essay on Chicago's latest and most spectacular facadectomy. 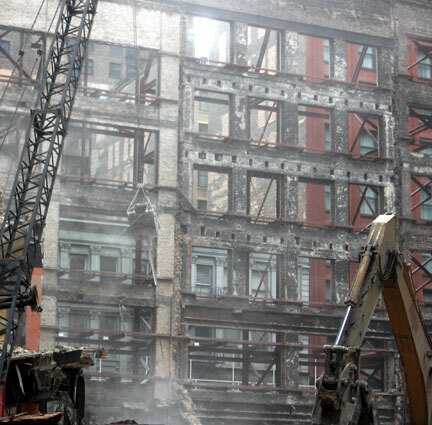 Now only the facades remain, but the buildings that were in the shadow of the Loop L were once mainstays of Wabash Avenue in it's heyday, including providing the home to one of Chicago's most legendary retailers, Kroch & Brentano's booksellers. 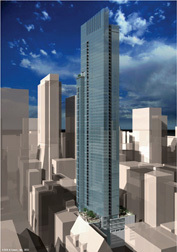 Although the structures formed the southern outpost of the protected Jeweler's Row Historic District, last year the Landmarks Commission voted to allow them to be demolished to make way for the Mesa Development's 72-story The Legacy at Millennium Park, a sleek, glass-walled condo tower designed by Solomon Cordwell Buenz. This was a controversial move, opposed by preservation groups such as Landmarks Illinois and Preservation Chicago, but I supported it in a previous article as a fair trade-off, as the facades were the only distinctive part of what were, in the last analysis, fairly ordinary loft buildings that had undergone numerous alterations that brought them far from their original configuration. 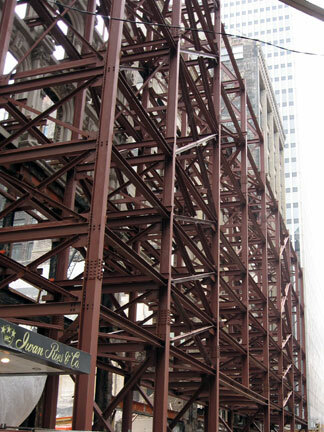 So, an extremely robust support skeleton was erected on what is normally Wabash's east sidewalk. Once the facades were secured to the skeleton, the buildings themselves were quickly demolished - as of this weekend, just a bit of the Kroch's buildings remained. The demolition temporarily brought to light an improvised mural high on the nearby Mallers Building. 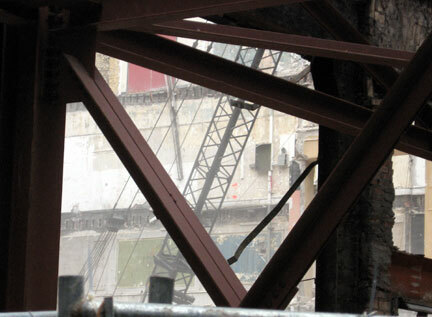 The methodology follows the trajectory of a previous Mesa project, The Heritage at Millennium Park, just a few blocks north on Wabash, where another series of vintage buildings, including the home of the storied but long-vanished Blackhawk Restaurant, were demolished after their facades were secured to a steel skeleton, and a condo skyscraper built behind them. Afterwards, the facades were completely restored and reconstructed, to beautiful effect, illuminated at night. The storefronts are now fully rented.